Hugel Pinot Blanc is a perennial favorite of the hospitality industry. If you are looking for an excellent value crowd-pleaser white wine for your Christmas party, or any party for that matter, you need a good quality Pinot Blanc from Alsace, France. In the 1980s, Chardonnay would fill this requirement, although more out of fashion than actually delivering the goods. But fashions change and the ABC (Anything But Chardonnay) mantra of the 1990s has evolved, broadening and liberating our tastes. Grossly underrated and caught in a marketing no man’s land between the fashionable Pinot Gris and the more thoroughbred Chardonnay, Pinot Blanc deserves a wider audience. If you consider that 95 percent of all wine purchased is consumed within 48 hours, Alsatian Pinot Blanc’s ability to imitate Chardonnay without the necessity of wood maturation or time in the cellar has to be appealing. For many years, Pinot Blanc and Chardonnay were mistaken for each other in their place of origin, Burgundy. The same occurred in Italy where it is called Pinot Bianco and has become hugely popular. Poring over countless pedestrian wine lists in search of a decent drink, Hugel Pinot Blanc has rescued me on many occasions from a dry argument. Even when the price is unpalatable in an international hotel, it is a safe bet. The venerable Hugel family has been instrumental in Alsace wine for more than 3 centuries. They produce some of the finest white wines in France. What impresses me most is their impeccable quality and remarkable consistency across the entire range, whether it be their unpretentious generic wines or extraordinary late harvest nectars that have virtually unlimited aging potential. 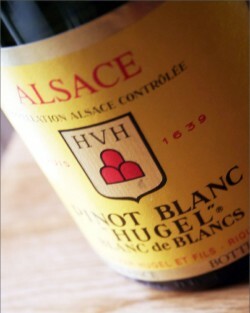 The 2003 Hugel Pinot Blanc is from an unusual year where the summer was scorchingly hot and dry. Pinot Blanc fared better than some varieties, being planted on clay-limestone soils, which have the ability to retain much-needed water. Yields were way below average, so there is an element of richness and concentration, although with lower acidity levels. It is more forward, but has lost none of its freshness and characteristic suppleness. If you are planning a trip to France, the Alsace-Route-des-Vins www.alsace-route-des-vins.com is one of the most beautiful wine vistas in the world. It is a road that follows the wooded foothills of the Vosges mountains, winding its way from north to south for 170 kilometres, through the vineyards and narrow streets of pretty medieval villages. Nowhere else in Europe will you see so many half-timbered houses, covered so profusely with flowers. 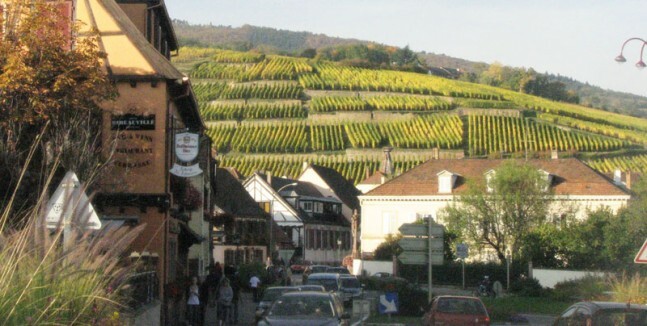 Alsace has been at the crossroads of Europe since the beginning of civilization. No other region in Europe has a greater number of feudal castles, a sign of Alsace’s tumultuous history. Traces of more than 400 have been discovered, although about 100 are relatively intact. Above the village of Ribeauvillé one can also see the remains of a mysterious megalithic pagan wall. Julius Caesar decreed the wine made in Alsace the best produced in all Gaul. Perhaps his judgment remains true more than 2,000 years later. The problem is these two grapes look almost identical in the vineyard. I suspect ampelography (the science of description and identification of the vine species) is of little interest to the average consumer, but fundamental for vignerons and tantalizing to the inquiring mind of wine buffs. In short, Pinot Blanc, like Pinot Gris, is a white clone mutation of the red grape Pinot Noir. Along with Pinot Auxerrois (also grown in Alsace) and Pinot Meunier, they form the nucleus of the Pinot family. Recent DNA fingerprinting suggests Chardonnay is related to Pinot Noir through an obscure white grape called Gouais Blanc, which was widely planted in Burgundy in medieval times. This is an interesting turn of events in the Pinot-Chardonnay debate. A semi-continental climate and protected by the Vosges Mountains, Alsace is the driest wine region in France. With vineyards at an altitude of 200 to 400 meters, cool nights and warm sunny days are perfect for aromatic white grapes to ripen slowly. Nearly all Alsace whites have a stony, mineral character and sometimes a smoky perfume, unless it’s Gewurztraminer, with its heady nose of roses and Turkish delight. Pinot Blanc is rather restrained in its bouquet, but should have subtle hints of apples, white peach, pears and fresh almonds. The palate will be more expressive in stone fruits with a citrus lift, although gentle and rounded with a hint of fruity sweetness and oily viscosity. Some producers blend in Pinot Auxerrois, adding a dimension of exotic flavors to the palate. One such producer is Domaine Paul Blanck, my benchmark for Pinot Blanc. Winemaker Frederic Blanck takes Pinot Blanc to another level. It is dangerously drinkable with a fantastic balance of acidity and minerality to rein in its opulence. Also appropriately bottled under stelvin closure (screw cap). Unfortunately, it is not yet available in Hong Kong. More widely available is Hugel Pinot Blanc, one of the best and a perennial favorite of the more savvy hospitality industry palates all over the globe. Always consistent in quality and agreeably fruity, it has a user-friendly suppleness that lends itself to many flavors. It is equally at home with a plate of freshly chucked Belons oysters at Bistro Bofinger in Paris as it is with salt and pepper baby barramundi with sweet soy and lemon at Longrain in Sydney. It is the quintessential wine for sushi.